Have you ever considered leather as a jewelry-making material? I mean, aside from using it occasionally for a necklace strap or rawhide bracelet? Whether you've thought about it or not, you might be interested to know that Melissa Cable has been doing a lot more than thinking. 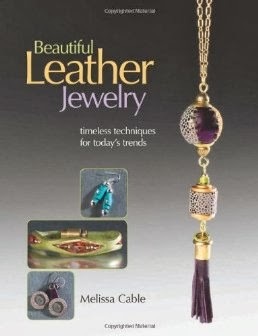 In fact, she's written a new book, Beautiful Leather Jewelry just for those who've been looking for something new. Before my copy of this book arrived, I found myself thinking, "Ok, fine. Some rustic looking jewelry (which I like, by the way) and some stuff made from leather straps. Whatever." I want to tell you I was totally wrong. Oh yeah, some of the projects are rustic looking, but many are elegant, classic, ethnic, and even futuristic. I'm not joking. There is a necklace that looks like something out of a Star Wars adventure. Thank you for this fabulous giveaway!!! Leather rocks in jewelry!!! Have you seen these lovely leather inclusions by Israel's HM Creative? I've shared the giveaway on my Facebook. Leather is fun to work with. I've been learning different techniques over the summer, but when it comes to jewelry it's been all adaptation for me. I'd love to see the books suggestions and am adding it to my reading list. Thank you for the chance to win it. Fromthebreathofdaydreams at gmail dot com. I would love to try this book! Pretty please count me in! Thanks! I would absolutely love to win this book. I have lots of leather that I need to do something with (Don't all of us beady types have stashes of stuff that we want to do something with?). Thanks for another great giveaway offer! I would love to learn to use more leather! Please enter me. Melissa is amazing. She comes up with such great idea. There is a video class for sale at www.craftcast.com where she shows you lots of tips and tricks with working with leather. I'm totally inspired!!!! I have heard this is a great book! I prefer to curl up with a book and study than scour the internet for ideas so consider me in on this drawing!! I would love it. This looks like a great book. I love leather and want to learn how to use it more. I've done everything with leather BUT jewelry-would love to give it a try! I have worked with beads and leather before, quit a bit actually. I made moccasins and mukluks for years with beadwork on them. But I have never incorporated leather with jewelry. I have thought about it a great deal, just never got around to it. I think this might just be the nudge to get me going in this direction with my jewelry. Hope I win. Thanks for the opportunity. This book looks very interesting! Thanks for the giveaway. This looks like a fabulous book to add to my collection. Thanks for the opportunity! Oooh, something new to learn. I would love to win this beautiful book of leather. I have a small stash of leather strips and it would be great to learn new ideas of what I can create with them. I shared on twitter and fb. Wow what an awesome looking book. Thank you for the chance to win it. This book looks like it has beautiful projects,i would love to win this book so i can create some new and wondrful pieces.Thank you for the chance to enter.